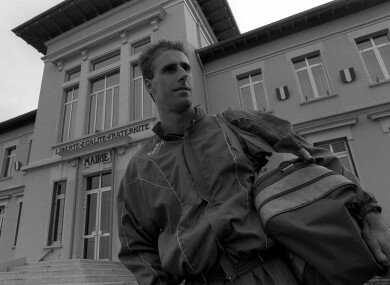 PERHAPS THEY CAN be given a pass as they were disentangling his beginners’ French from his stubborn Barnsley accent, but when Mick McCarthy joined Lyon from Celtic in the summer of 1989, L’Equipe committed the kind of error that would have made a rich diet for the Irish sports media a quarter-century later. “Like all British players, he is cool and reserved off the pitch,” wrote the famous sports newspaper when the Irish captain swapped Glasgow for a club newly-promoted to Ligue Un. McCarthy wasn’t the first Irish player to move to France – Frank Stapleton spent the previous season with Le Havre and Noel King had a brief four-month stint with Valenciennes in 1985 – and he signed for the club having impressed at Euro ’88. “We were looking for a central defender, and we had only young players so we needed experience,” Raymond Domenech, McCarthy’s manager at Lyon, tells The42. Domenech signed McCarthy having seen him play for Ireland at Euro ’88, with L’Equipe testifying that owner Jean-Michel Aulas had “broken the piggy bank” to snaffle McCarthy’s services. McCarthy, for his part, told the French press that he had joined as he had been dazzled by the facilities, had been eager to work with Domenech, and had a grá – sorry, amour – for the French since Euro ’84. 'McCarthy looks for his place' say L'Equipe in September 1989. In a 2009 interview with FourFourTwo, however, he remembers it slightly differently. Somebody rang me up and asked if I’d be interested. I have to say I didn’t know exactly where Lyon was. It wasn’t as easy then. You didn’t go on the internet and just type Olympique Lyonnais and find out everything about it. McCarthy reflected on his career in French football in that interview, settling on one word: merde. He lasted just eight months and played just 10 times before moving to Millwall on loan ahead of the World Cup. He was hampered by injury – having had knee surgery prior to joining, it flared up throughout his brief stint in France – and also struggled to adapt to an unfamiliar libero (sweeper) role. L’Equipe dedicated a full piece in September 1989 to explaining McCarthy’s troubles in this new role. While they were profligate with their compliments to the Irish international – “Mick is a model of calm”; “His combativeness and courtesy have already made a mark at OL” – they pointed to how relatively backward British football was as proof that McCarthy was unfamiliar with the role. They claimed he was at least partly culpable for a half-dozen goals conceded at that point of the season and floated the possibility of McCarthy being dropped for youngster Pascal Fugier. When his knee flared up, McCarthy was replaced, but by Remi Garde, who later managed Aston Villa in the Premier League. Garde partnered future Bolton defender Bruno N’Gotty in Domenech’s defence, but the manager remembers McCarthy’s attitude during his absence from the first-team. “Spirit-wise he was exceptional,” says Domenech. He was a great man. For the young player, he was an example of how hard to work even if you aren’t playing. For the young players it was a benefit to see a real professional. McCarthy struggled to get back into the team, and L’Equipe’s friendly disposition had changed somewhat by the following March. In a small interview piece called “Sur Le Grill”, they didn’t mince their words with someone they were now calling Mike Mac Carthy. Mike Mac Carthy is put under the cosh by L'Equipe in March, 1990. They asked him if he was justifying his transfer, to which McCarthy replied that he couldn’t justify it if he was injured. He then said that he was working “like crazy” to get fit, and recently started his comeback with an appearance in a third division game. “Mike” was then informed that he couldn’t make the leap from the French third tier to la Coupe du Monde, to which McCarthy assured them that “everything will be fine”, stressing that he was confident that he would be in Jack Charlton’s squad for Italia ’90, if not the starting XI. In the end, McCarthy’s desire to play at that tournament hastened his departure from the club weeks after L’Equipe chucked him “sur le grill”. “My career was about football and I wasn’t playing,” McCarthy told FourFourTwo. I wanted to play in the World Cup in 1990 and Millwall came up. I’d just put the last roll of wallpaper in the house when a guy from Millwall rang. I didn’t want to leave Lyon. I wanted to play in the World Cup and the only way to do that was by playing first-team football. The move worked out. McCarthy started all of Ireland’s games, and ended the tournament with the dubious honour of having committed more fouls than anyone else. Domenech is the manager of Brittany at the moment, and is eager to work again in international football. He hasn’t been tracking Irish football too closely, however, and was unaware that McCarthy has returned for another stint as Irish manager. “I expected him to be a good manager… he is a very good man,” ruminates Domenech. In spite of his widely-derided reliance on horoscopes, some of Domenech’s predictions have been accurate. Email “Remembering Mick McCarthy's brief and forgotten spell with Lyon”. Feedback on “Remembering Mick McCarthy's brief and forgotten spell with Lyon”.